If you have questions or concerns regarding the care you received at one of our facilities please contact a Patient Representative. Ask to have the media representative paged. Representative available Mon-Fri, 8 a.m. - 4:30 p.m. Which location type should I choose? Which type of care should I choose? Choose one of the locations below to schedule a primary care clinic appointment. Find information for specialty care or other non-primary care appointments on our specialty page, or by calling 763-581-CARE. Call 763-581-CARE to request an appointment or be connected to any of our services 24/7. Trustworthy information, straight from the source. Education is the first step in an empowering healthcare plan. Learn more about sleep apnea from prevention to diagnosis and treatment. Sleep apnea is also called obstructive sleep apnea. It is a condition that causes you to stop breathing for 10 seconds or more while you are sleeping. During normal sleep, your throat is kept open by muscles that let air pass through easily. Sleep apnea causes the muscles and tissues around your throat to relax and block air from passing through. Sleep apnea may happen many times while you are asleep. How do I reduce the risk of sleep apnea? Do not smoke. Nicotine and other chemicals in cigarettes and cigars can cause lung damage. Ask your healthcare provider for information if you currently smoke and need help to quit. E-cigarettes or smokeless tobacco still contain nicotine. Talk to your healthcare provider before you use these products. Do not drink alcohol or take sedative medicine before you go to sleep. Alcohol and sedatives can relax the muscles and tissues around your throat. This can block the airflow to your lungs. Maintain a healthy weight. Excess tissue around your throat may restrict your breathing. Ask your healthcare provider for information if you need to lose weight. Sleep on your side or use pillows designed to prevent sleep apnea. This prevents your tongue or other tissues from blocking your throat. You can also raise the head of your bed. What are the signs and symptoms of sleep apnea? No signs of breathing for 10 seconds or more while you sleep. Snoring loudly, snorting, gasping or choking while you sleep, and waking up suddenly because of these. A hard time thinking, remembering things, or focusing on your tasks the following day. Bedwetting or waking up often during the night to urinate. Feeling sleepy, slow, and tired during the day. How is sleep apnea diagnosed? Your healthcare provider will ask about your signs and symptoms, when they began, and how bad they are. He may ask about medical conditions you have and what medicines you take. Tell your healthcare provider if you smoke and whether anyone in your family has sleep apnea. Your healthcare provider may ask the person who sleeps beside you about your signs. You may need to wear a device that monitors the oxygen level in your blood while you sleep. You may need to have a sleep study (polysomnography) if you have daytime sleepiness. A sleep study helps show your brain, heart, and respiratory system are working during sleep. Sleep studies may monitor the stages of sleep, oxygen levels, body position, eye movement, and snoring. Physical examination may reveal narrow pharyngeal airway, nasal obstruction, HTN, neurologic abnormalities, and/or increased BMI. CBC, UA, thyroid panel, drug screening, and other tests may be ordered to assess for medical conditions causing SA (e.g., hypothyroidism, adverse drug effects). PSG, the gold standard for SA diagnosis, provides comprehensive recording of the biologic changes that occur during sleep, including sleep cycles/stages by EEG, EMG, electrooculogram (EOG), ventilatory measures (e.g., respiratory rate, effort, air flow), arterial oxygen saturation, and EKG. The Epworth Sleepiness Scale assesses the degree of EDS. Lateral neck X-ray assesses nasopharyngeal patency/size of tonsils and adenoids to identify if adenotonsillar hypertrophy is present. CT scan and MRI may be ordered to assess for neurologic disease. How is sleep apnea treated? 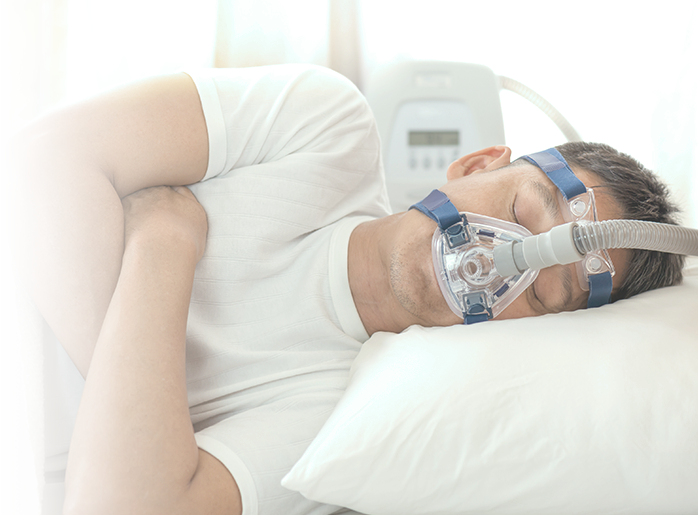 A continuous positive airway pressure (CPAP) machine is used to keep your airway open during sleep. A mask is placed over your nose and mouth, or just your nose. The mask is hooked to the CPAP machine. The CPAP blows a gentle stream of air into the mask when you breathe. This helps keep your airway open so you can breathe more regularly. Extra oxygen may be given through the machine. A mouth device may be recommended by your healthcare provider. The device looks like a mouth guard or dental retainer. It stops your tongue and mouth tissues from blocking your throat while you sleep. Surgery may be needed to remove extra tissues that block your mouth, throat, or nose. How can I manage the symptoms of sleep apnea? When should I seek immediate care? You have chest pain or trouble breathing. When should I contact my healthcare provider? You feel very tired or depressed. You have trouble staying awake during the day. You have trouble thinking and remembering things. You have questions or concerns about your condition or care. North Memorial Health looks at healthcare differently. We empower customers to achieve their best health because engaged and informed customers have better health outcomes and better lives. Can a healthcare system make healthcare...healthier? We say yes. © 2019 North Memorial Health. All rights reserved.